Lower power consumption: An 85 thousand transistor circuit drew .25 milliwatts and had a standby leakage of 5 - 10 nanoamperes. The process was meant to allow calculators to run for a year from a set of small batteries but several owners have reported that they are still running on their original batteries after 20-22 years. Higher density - three times that of previous ICs. This allowed sophisticated calculators to be built with just two or three ICs and sell for modest prices. High reliability: The ICs had intermediate oxide layers to trap contaminants and were routinely inspected and tested at elevated temperatures. The ICs were designed to survive electrostatic discharges in excess of 4000 volts. Previous HP's had a flexible sheet under the keyboard to protect the electronics from minor spills and dirt. The 10C series took this further by having a single large sheet of film under the keyboard that wrapped around the electronics and overlapped at the back. This sheet consisted of three bonded layers: the outer layers were nonconductive, but the center layer was conductive. There was also an inner conductive film surrounding the main circuit board. These films gave the CMOSC chips a high degree of electrostatic protection. The majority of the calculator body housed only the keyboard. All of the electronics where built onto a small flexible circuit film that was bonded to the back of the LCD. A plastic fastener held the end of the circuit film to the keyboard. 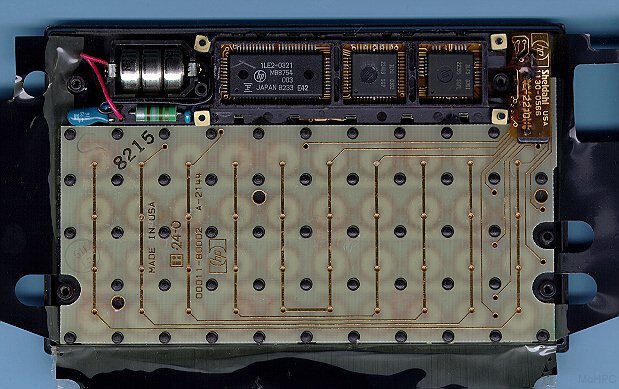 The entire LCD/chip module sat on foam rubber pads (small white squares seen in the picture above) to protect it when the calculator was dropped. 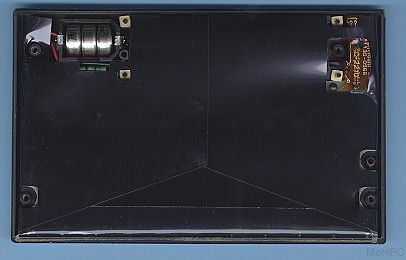 A rubber sheet with a stainless steel snap disk layer attached to the lower side sat between the protective film and the rigid keyboard circuit. The disks connected the outer circle of the circuit board to the center point when the keys were pressed. 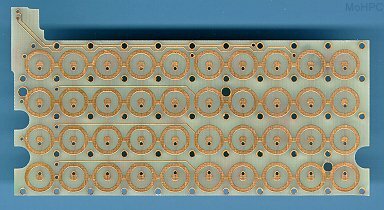 The top of the calculator was heatstaked to the keyboard circuit board in 47 places to produce a rigid and consistent keyboard feel. The bottom half was pressed into the top half along slanted surfaces to make a tight fit and attached with four screws which were then covered with the rubber feet to produce a finished appearance. The result was a very small, solid and durable calculator.